I spy with my little eye... midwifery in the 1950's. 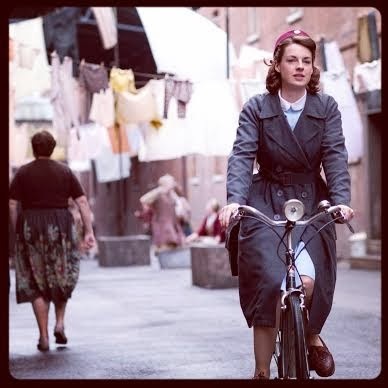 Since I introduce you to the mini BBC series "Dancing on the edge" a few months ago, I thought I'd write a post on an other BBC series that swept me off my feet: "Call the midwife". Please note that as much as I like babies, I'd like to think I am not obsessed with them, and even if I was, the fact of seeing at least 2 or 3 women going through the pain of giving birth (without epidural obviously) each episode would probably calm me down. What I'm trying to say is that it is not a series about babies and toddler but rather a social painting of Eastern London in the 1950's and was created after Jennifer Worth's (1935-2011) memoirs. The series follow the life of a nunnery and the midwives working there, delivering babies in a rather poor community, daily challenged by insalubrity, prejudices and the absence of contraception. My generation was born with contraception, having a child is a choice, not a fatality (that's if you know how to set an alarm clock on your mobile ladies), so we tend to forget it wasn't always like that and seeing women managing their 12 children is somehow, I felt, rather brutal. The characters are all very endearing and full of compassion. I have a thing for Chummy's clumsiness and naivety, and the nuns remind me of the one year I spent in a nunnery back in Paris (not that I was planning on joining the Church, I was just renting a room). I can easily relate to these midwives sneaking whiskey in their rooms! No need to say I highly recommend it (the series, not sneaking whiskey in your room), two seasons are out already (yes, this post is a little bit belated, what can I say, it's a vintage blog, not all about novelty), and the third season has started.